In 1948, the XIV Summer Olympic Games came to London, a city still recovering from the ravages of war. Rationing remained in force and many people had been left homeless, yet the bomb-cratered city rose to the challenge of hosting the world's greatest sporting occasion. These 'Austerity Olympics' were not only the first post-war Games, but also the first Olympics in which British television played a role. The Olympic Torch was carried from Athens to London via relay and arrived at Wembley on 29 July. The sailing events took place at Torbay and initially there was no plan to carry a flame to Torquay. However in mid-June pressure was brought to bear on the Olympic Committee who relented once Torbay Council agreed to bear the cost of the 107 torches at £1 15s each – additionally Shell-Mex charged £3 per day for the burner and bottled gas. The relay of 214 miles to be run over a twenty-six hour period was arranged to arrive at Torre Abbey Meadow at 11am on Monday August 2, that date being the Bank Holiday Monday. The route from Wembley passed through Uxbridge, Slough, Maidenhead, Reading, Basingstoke, Andover, Salisbury, Sherborne, Yeovil, Exeter and Newton Abbot. From London to Exeter the A30 was used, from Exeter to Chudleigh the A38, the B3193 to Kingsteignton and Newton Abbot and the A380 into Torquay. The relay commenced at 9am at Wembley Stadium with the first torch lit by Lord Burgley, Chairman of the organising committee. The route utilised 107 runners, each covering a two mile stretch and each with their own torch that was theirs to keep afterwards. Chard in Somerset was reached at 3am on 2 August where an estimated crowd of 3,000 watched the torch pass despite the early hour. From the Guildhall in Exeter the torch was carried through Alphington, Peamore and Kennford and to the summit of Haldon Hill where 20 year old George Phillips, a Navy Lieut-Commander took over from a runner who he commented was 'completely exhausted'. George carried his torch to the milestone at Harcombe Cross Garage and was followed by Terence Huddy, aged 23 originally of Dartmouth but at the time employed by the dockyard at Devonport. Throughout these stages the runners were accompanied by an RAC patrolman on motorcycle and sidecar who acted as pace-maker to ensure the relay kept to time and most importantly arrived at Torre Abbey at exactly 11am. At 9.15am at Chudleigh Police Station Huddy passed responsibility to J. Brinton of Teignmouth. 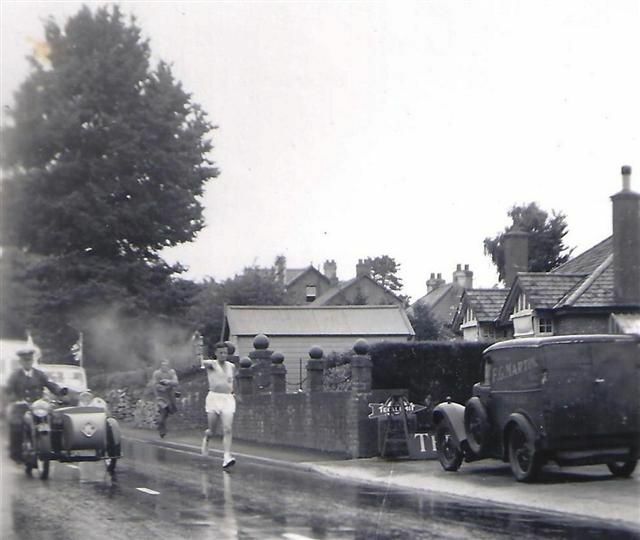 From the Police Station, Brinton took the torch to Chudleigh Knighton Toll House (near Buckingham Orchard) where he was relieved by P. M. Luffman (Devonport YMCA Harriers) who continued to the Kingsteignton Secondary Modern School (today Teign School). By now spectator numbers were greater and W. Hibbert of Newton Abbot – who followed Luffman – took the torch onward to Newton Abbot at which occurred two unplanned events that threatened to disrupt the strict timing of the event. However the remainder of the relay kept to time and the 107th runner, S. Francis brought the flame onto the Torre Abbey Meadow as planned at 11am. The opening ceremony at noon on Tuesday 3 August was conducted by IOC chairman: Mr. J. Sigfrid Edstrom and witnessed by a crowd of 30,000. The sailing events comprised 75 boats and 221 competitors. The closing ceremony took place on 12 August with medals distributed by Sir Ralph Gore, President of the International Yacht Racing Union. Great Britain ranked third in the medal table after USA (1st) and Denmark (2nd), the one Gold Medal awarded to GB was picked up by sailors David Bond and Stewart Morris.